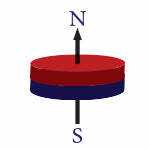 0.591" (15mm) dia x 0.010" (0.25mm) thick, N50 Rare Earth Neodymium Disc Magnet, Magnetized through the thickness. Nickel Plated. Overall is still usable but magnet is slightly weak.